Upon reading the title of this article, you might wonder, “Does he really mean ‘multi-church’ and not ‘multi-site’?” Nope! The multi-church movement is taking hold in England and is serving rural congregations exceptionally well. The Arthur Rank Center (a rural-church think-tank in England) has an entire page devoted to “multi-church groups,” providing training, ideas, and research on multi-church ministry. So what is multi-church ministry? So glad you asked! In a multi-church group, individual churches partner together, sharing resources (including leadership resources like clergy). Each church keeps its own finances, and remains its own missional entity. A multi-site church is a single legal entity, and shares resources, but often from a top-down model of leadership, with all materials, curriculum, and even sermons originating from the main campus. Multi-church groups are nothing new in many regards. 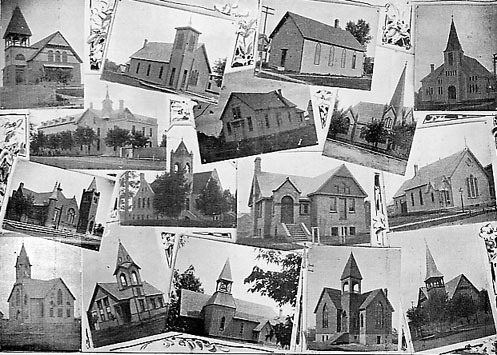 Methodist pastors in the United States and England famously rode circuits on horseback, moving from one church to the next for preaching, communion, and baptisms. Many still do, pastoring what are termed multi-point charges. A Baptist minister I know pastor’s two churches in our county. With urbanization likely to increase over coming decades, rural communities and churches will (in many cases) face great challenges for survival and vitality. According to the Arthur Rank Center, Multi-Church Ministry may be a positive trend in rural communities. Each of these five priorities deserves its own post, so over the next few weeks, I’ll examine each of them and how they might apply to rural ministry. What priorities would you suggest for rural churches, or for multi-church groupings? A number of interesting questions may emerge concerning these five priorities. What might “discipleship appropriate to the rural context” mean? How can quipping lay leaders impact the mission of the church? What are the major differences between multi-site churches (which are really a single entity) and multi-church groups (which are a missional network)? How might church structure and governance help (or hamper) missional engagement? What kinds of ecumenical partnerships might emerge as a result of multi-church networks? One example comes in a multi-church partnership developing in my county. The Middlesex Ministers Association is helping develop an interdenominational council of lay leaders to help ministers in the area with pastoral care, visiting the home-bound, and leading worship in nursing homes. We are stronger when we partner together than when we struggle alone. How might a multi-church approach to ministry meet the needs of your rural community? What are the downsides, if any, to such partnerships? I’ll be interested to hear your comments! I have heard of pastors from small neighborhood churches getting together with others outside of their denomination for prayer. That seems a positive way to start a movement in this direction. Janice, I agree that prayer has the ability to serve as a powerful unifier, and is always a great starting point.